We’re constantly talking about new technologies, products and media that relate to robotics. Now, we’ve decided to let you in on the conversation, and to take a peek at the things that are piquing our interest. 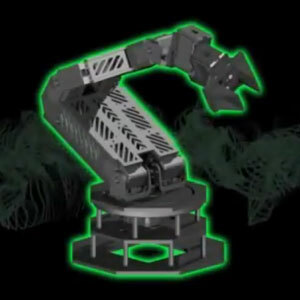 This episode focused on Robotis and their line of Robot Actuators, the DYNAMIXELS. (0:47)First Andrew talked about the MX DYNAMIXEL robot actuators, including their history, features and why he loves them so much. (16:27) Matt and Andrew went on to talk about ROBOTIS and why they’re so successful. They also shared some stories of their trip to South Korea (19:35) and some rarely seen footage of the trip. (23:10) In the Sneak Peak section, they showed off some of our products that are currently in the pipeline. Matt showed off a new mobile robotics platform based on the Budget Bot. However, this platform uses the Arbotix RoboController and will have a built in robotic arm, making it an amazing mobile research platform. Andrew showed off the two new MX based Robotic Arms that Trossen Robotics will be releasing. These arms use the MX-28 and MX-64 DYNAMIXEL servos, making them our most powerful and smooth arms to date. They also gave us a look at a new joystick control panel for controlling our robotic arms. (31:31)For this week’s Tips and Tricks, Matt shared tips about weights, both for testing load capacities on our robots, and for weighing down arms and cameras. Andrew showed us how to make a quick experimenter’s power supply with a computer power supply, and where to go once you need even more amperage. People use the things they buy from us to a lot of different tasks. From lifting gates to building robots, we see a lot. One of those things is implanting RFID tags in the human body. We carry Glass Ampoule Tags, but we’re pretty clear that we do not advise or encourage users to implant the RFID tags we sell into humans. However those interested in implants can look no further than Amal Graafstra’s new store, Dangerous Things. Amal is a long time friend of Trossen Robotics and has undergone multiple implantations of RFID tags. Amal has written a book on RFID and done work on our own RedBee RFID reader! His experience and expertise in the field make it especially well suited to head this new store. The new store has sterile tags, injection kits, readers, and an access controller! There are even forums where you can ask Amal himself about RFID implantation. Check out even more information on the DYNAMIXEL PRO line! You read right, 399kg-cm! That’s almost 4 times the torque of an EX-106! We know what’s on our wishlist for 2013, the DYNAMIXEL PROs! In this episode of Trossen Robotics Shop Talk, we focused on the amazing Raspberry Pi, and the evolution of embedded computers. The recent progress from the larger SBCs to the smaller boards that are blurring the line between linux computers and microcontrollers has opened up whole new worlds to professional and hobby roboticists. . The effect that these smaller computers have on projects is evident in some of Matt’s early Robot Prototypes, as he shares in the video. Andrew gave a shout-out to the Reddit Robotics Community and the Arduino Community , two great places to learn new things about the Robotics and Arduino World. Kyle mentioned the newly revamped Trossen Robotics Community and the return of the TRC Contest. Matt told us that ServoCity has a great library of parts from gears and pulleys to rods and gearboxes. We shared some of our favorite new products, including our new 3-Axis Joystick and 2-axis joystick and the Seeed Motor Shield.We also showed off some of our new products including our RobotGeek Voltage Dividers and our own Squid Cables. 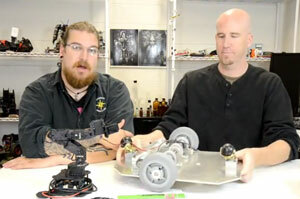 We also took a look at our 6v Gearhead Robot Motor and our awesome new Budget Bot Chassis. Finally we talked about our great new PhantomX Pincher Robot Arm and PhantomX Reactor Arm. At the end of our show, we watched some of our favorite “Terrible” Robot Movies. 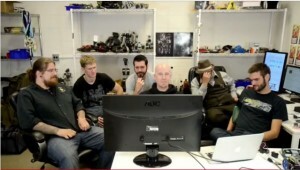 Andrew reminisced with the robot that got him into mechs, Robot Jox and Matt subjected us to the bizarre Demon Seed. 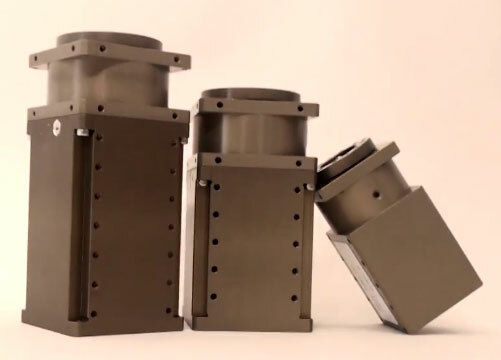 Check Out the PhantomX Reactor Arm Product Feature Video! Our new PhantomX Reactor Arm has some amazing features and specs, as shown in our new video. This arm uses the Arduino Compatible Arbotix Robocontroller to control its array of AX-12 Dynamixel servos. These servos allow the arm to lift 200 grams at 30cm, 400 grams at 20cm, and 600 grams at 10cm! With a 80cm Work area and a 300 degree reach, this arm is great for a variety of applications. And add an additional servo to give your arm wrist-rotation for even more flexibility. DYNAMIXEL PRO Actuators are coming! We’ll keep you posted as we learn more details about these amazing actuators. And once these actuators are available, look out for some awesome new Interbotix Labs products based around them. Check out the Teaser Video below! Robot Bootcamp is our newest series and a great place to get started in the world of robotics. In this primer video Matt and Andrew talk about different materials and manufacturing methods associated with them. They mention different kinds of plastics, metals, and when to use them for different kinds of robots. If you’ve ever wondered about creating custom parts for your robots and projects, this video is a great place to start. Future videos will cover basic robotic concepts, common pitfalls, general practices and more! If you have any comments on our Bootcamp Video, or questions for future videos, leave a comment below!